The developers have created a game that lives mainly through its characters, since every one of them is different and comes with its own story. Likewise, much effort has Blizzard done even with the hidden Easter Eggs, which are found in the game. - Hearthstone: On many maps, you can find computers and laptops, where someone plays a game Hearthstone. For example, on the Hollywood map in the Security Zone; one of the security guards has preferred to play a round of Hearthstone, rather than pay a little more attention on the surveillance cameras. 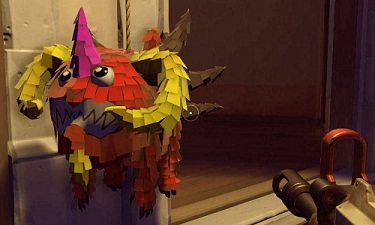 - Diablo Pinata: On the Mexican-themed map Dorado, many Pinatas can be found on the festively decorated market place (the cute characters, which are often made of paper mache and filled with sweets). One of the particularly figures has the shape of Diablo, the end boss of the same name Diablo series from Blizzard. And yes - the pinatas in Overwatch are full of sweets. - Murloc at Rikimaru Ramen Shop: On the Map Hanamura, you can find a small noodle shop named Rikumaru. The mascot is a small, green monster - a Murloc. Do you take your favorite weapon in hand and begin to fire on the great figure out, then you might have luck and it makes known Murloc sound: RwlRwlRwlRwl. - Murloc Graffiti: The troopship in the Temple of Anubis is embellished with a special graffiti. So you will find on one side a larger than life image Murloc with its famous sound. - Heroes of the Storm: One of the starting areas on the map, "Hanamura" is located in an arcade with various slot machines. On one of these machines, you can find the game "Fighters Of The Storm" which is a reference to the Blizzard title "Heroes of the Storm" is running. If "Fighters Of The Storm" is not enough, you can also watch the marvel’s sequel "Fighters Of The Storm 2". Here occurs for example Garosh Hellscream, the former Warchief of the Horde from the World Of Warcraft universe, to the fight. - Goldshire Pictures: Anyone who has ever played as a human being in World of Warcraft, knows the small tavern in the village Goldshire at the gates of Stormwind. Apparently the villagers have worked hard and established an entire movie studio. With famous titles like "Hero of my Storm" or "They came from beyond the moon". The studios on the "Hollywood" map you will also find a water tower to the Warner Brothers. And a camera arm that is with Killrog labeled (The view magic of warlocks of World Of Warcraft). - Horde Hieroglyphics: Look a little more closely in the ruins on the map Temple of Anubis ... there you will find between many hieroglyphs one or the other symbol of the World of Warcraft Horde. - The last Easter Egg is a professional Starcraft 2 player D.Va: He is a professional StarCraft 2 player who was ranked 1 in the world rankings with 16 years. Blizzard even goes to the extent that they own profile in the real player database of Starcraft 2 score. Scattered over the different maps you will always find posters and merchandise, the fighter with the Mech and the ruff.